DPA: Fashion jewelry has long embraced the expandable bracelet, but it’s rather new to luxury jewelry brands. What do you think is driving the trend? DO: The world is getting more and more casual as consumers embrace athleisure attire and travel more than ever. Modern stylish consumers (both men and women) want jewelry that can be dressed up or down and give them freedom from difficult clasps or maintenance issues like sizing. DPA: Besides the gorgeous diamonds and gemstones, the craftsmanship in these pieces is a lot different than just stringing the gems on a stretchy band. Can you tell us more about that? DO: In the Picchiotti Xpandable Collection, for example, the rings and bracelets incorporate patent pending hidden technology that will never loose elasticity and that solves two problems. In rings, it solves the problem of sizing as the rings expand up to two sizes, so they fit comfortably for life, even if the wearer changes size over the years (or if she opts to wear the ring on a different finger). In bracelets, the Xpandables solve the problem of the clasp, which is always a challenge. These expanding bracelets slide on easily and comfortably so that no clasp is required and no assistance needed when dressing. 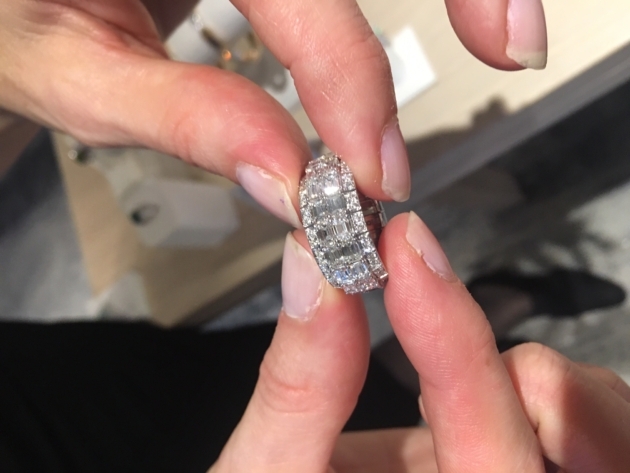 DPA: Do you see more brides opting for stretchy diamond rings? DO: Yes. The bridal category also offers various expanding styles to address issues like big knuckles and lifetime wear. DPA: So the future looks bright for luxury expandable collections? DO: Absolutely. As consumers continue to live more active lifestyles, traveling more than ever, expandable jewels offer great value and more opportunities for being worn.